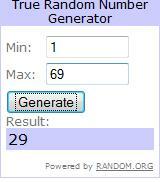 Here is the winners of a giveaway. ~ on a side note. I am a little frustrated with some of these companies. The water bottle one in particular. I was approved to do a giveaway, then right when the giveaway is coming to a close the tell me it is just a review! To late! I'm already running the giveaway! Then they finally get back to me and tell me that they had to change it because it is a charity, and the cost is too much to manufacture. I feel bad, but they should have thought of that before. Then they want me to give the winner the bottle I have already been using. I don't have a problem with that, but I think the winner deserves a new bottle. I really hope they send my winner the bottle. If not I will have to forward them my own.